When To Start Puppy Obedience Training? Poppy, Our Beautiful Golden Cocker Spaniel Puppy! 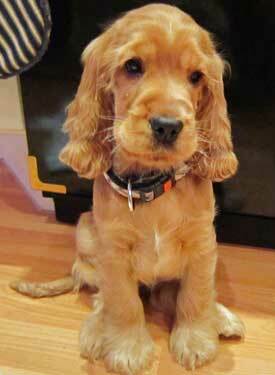 We are picking up an 8 week old Cocker Spaniel on the 4th February. Your site is excellent, very helpful, but one question we have is regarding when we should start our puppy's obedience training, eg., watch, sit etc? Is 8 weeks too young to begin? Hi Mike, Thanks very much for your kind words about my website! A new puppy - exciting times! Eight weeks is the ideal time to start training your puppy. Try two or three short sessions each day and make sure your puppy masters each training session before moving on to the next. Also make it fun - don't get angry or disheartened if she doesn't get it right. She'll get there in her own time. Don't forget to continue with your puppy's socialization - this is so important and can have a big impact on how your puppy will turn out as an adult. Please don't underestimate the socialization process. You can learn about it here - Socializing Your Puppy. When she gets settled, why not send us a photo and let us know what she likes to get up to and how she's progressing? You can do this here - Send your Cocker photos here. Comments for When To Start Puppy Obedience Training? Your puppy is so cute - you'd never think she was capable of being mischevious, would you? I think she's so lovely and such a pretty little thing. Don't worry, all puppies bite and nip. I'm sure she'll grow out of it if you keep up with the training. Many thanks for this useful advice, I think we are beginning to see some improvements in Poppy already, consistency is very important as you say. And, as you say, we will get there in the end. PS: I hope you like the photo of Poppy taken recently! Hello Michael, Christine, and Poppy! Congratulations on your new puppy - she sounds a little darling! If she's still biting and nipping, I recommend you up your game a little. Instead of yelping when she bites, try saying in a very low, loud, stern tone, 'No' and turning away from her - ignore her for a minute or so. If she continues to try to bite, say 'No', but this time, pick her up quickly and place her somewhere safe on her own for a little time out. Do this consistently and eventually she'll learn that nipping and biting stops all the fun. Stick to it and you'll get there eventually. PS: To encourage her to drop an item in her mouth, try using a tasty morsel as a 'trade off'. As she drops the item to take the treat, say the word 'Drop' - it usually works quite well. Greetings from Austria and thanks for your helpful reply! We picked up Poppy and she has now been with us for 3 weeks. She is proving a wonderful new member of the family, seems very intelligent and has learnt and mastered how to sit, lie down, and stay. She seems to retrieve things quite naturally, although we are working on her dropping the items that she returns. However, there is one concern that we have - Poppy has always, since her arrival, nipped and bitten mainly our clothing and our skin, mainly toes, feet and hands. We recognise that it is normal puppy behaviour, and we have been following your advice on the site closely, however this appears now to have developed into more agressive behaviour as she growls and refuses to let go and respond to our commands. In fact the bites really hurt. We do give her lots of attention during the day. Please will you advise us?